Thought I would kick off this section with something a special - at least special to me. I bought this set from a friend a while back and think it's pretty unique since it seems to be unused and pretty much as shipped. To me it's a treasure. I don't know the model number of the set or the mic - no model markings - or have an idea of time frame. If anyone knows I would be grateful. 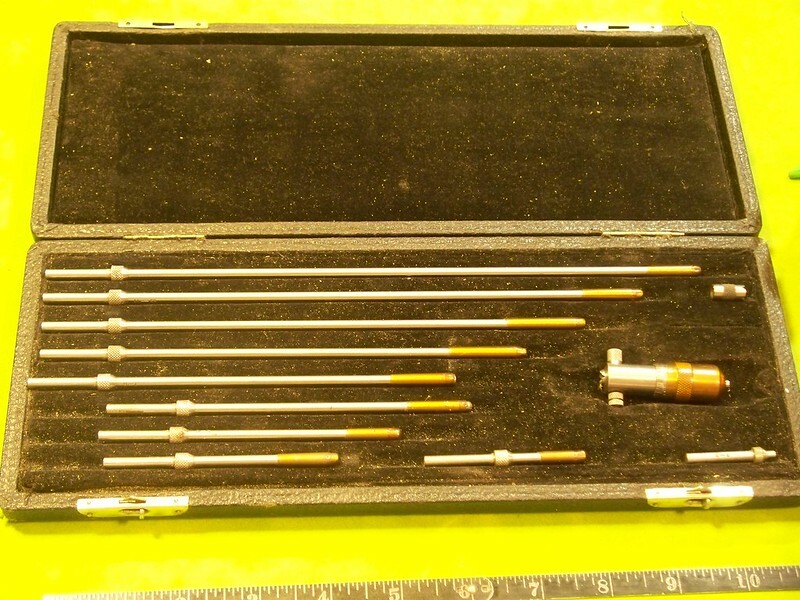 Set goes from 1 to 12"
The rods all (except 1-2") still have the wax on them as does the mic body. I don't have my Starrett books handy, I believe it's a no. 123 or 120. Could be wrong. I would say its a 1950's model. Thank you. I am sorry for the bad color in the second pic. I just looked it up. I was wrong on the number by one. It is a no. 124. Awesome! I really appreciate it thank you. My 1938 Starrett catalog shows this same inside mic in it. You could buy it with a case. It doesn't describe the case any. So my guesstimate on age may bring this earlier than 1950. 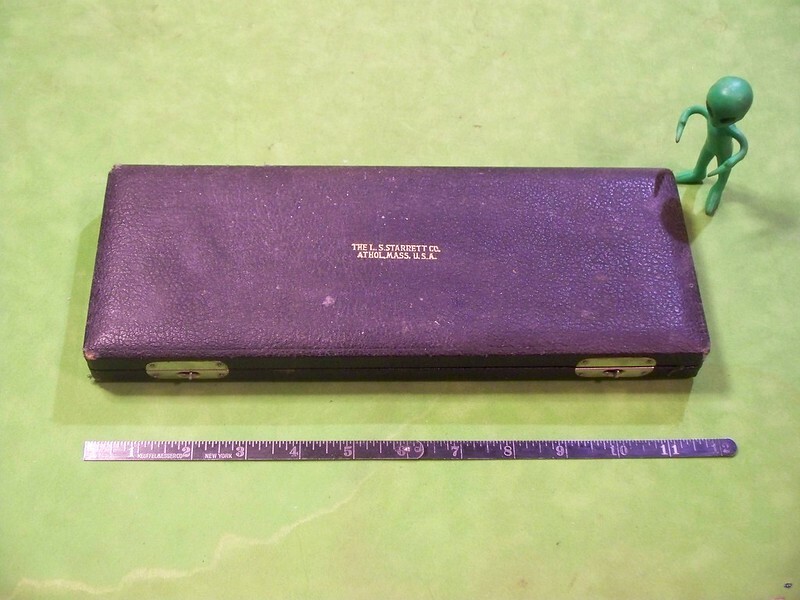 And they did have the leatherette finish cases back then, too. So you have it. I didn't realize these inside mics were made that far back in Starrett history. You have a real gem there. Oh, the wax coating on the anvils, that's not original. In the bigger companies where they have large QA/QC programs on calibrating measuring tools. They will seal the ends of the rods where the adjustments are made for calibration, so the tool is guarantee correct before it goes back to the shop for use. Missing from the set are the wrenches that are used to adjust the measuring tool for calibration. It is done intentionally so the instrument is not tampered with between calibration checks. Thank you again. 1950 would make it older than I am (although I won't say by how many years) so I like that. If the wax was added later than I have no qualms about using it and removing it. I thought it was factory. Ken is probably right about the wax on the business end. Our mic standards always came back from calibration with the wax on the ends. Thanks. I never knew that but I never worked in a place where calibration was done either. When a large manufacturing plant layed off a few years ago, machinist mesuring tools could be had very cheap. I bought a set like that from a pawn shop for $30.